Corsair's first ready-to-go PC is coming. When you think "Corsair" you probably associate the company with cases, mice, keyboards, RAM, and plenty of other PC components, but never all together as one product. That's about to change with the upcoming Corsair ONE PC, the manufacturer's first foray into a fully built and ready to go system. 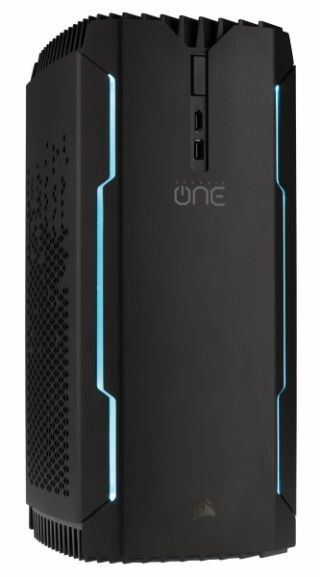 According to AnandTech, the Corsair ONE is a compact tower PC, too small for a full ATX motherboard, with a case designed loosely on the existing Carbide 330R and Obsidian 550D. There are fins on top, and instead of the side window found on a lot of modern cases, there are triangular ventilation holes on both sides. Corsair hasn't completely abandoned "gamer" designs just yet though, as some lighting runs down the front panel. The front panel also contains a single HDMI and USB port. Corsair hasn't released the full details of the case yet, nor what will actually be found inside of the PC when it's ready. However the front port panel would suggest easy access for virtual reality headset cables, so we're expecting something fairly powerful in terms of hardware. Even the ONE's official website is scant on details, with just a picture and an option to sign up for an email alert when it's ready for release. With no pricing and no availability announced yet, we'll have to wait and see what Corsair has in store.